A gold-standard processing package that's hard to fault. You'll use this one again and again. It's easy to use. Great Sound. Low CPU usage. Full of possibilities. Well-written manual. Routings and presets to get you started. 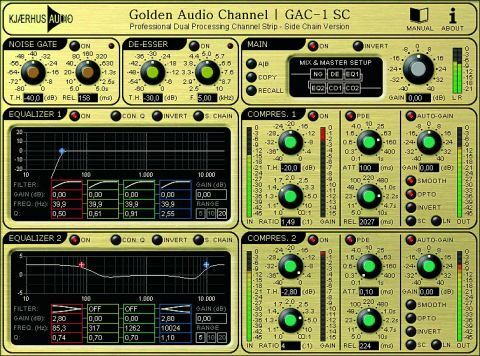 Featuring a noise gate, de-esser, two equalisers and two compressors, Golden Audio Channel (GAC-1) is an all-in-one sound processing package from Danish company Kjaerhus Audio. There's no wasted real estate on the golden GUI, which invites you to dive right in and start processing. The interface is divided into eight different sections, with the thin bar across the top providing quick and easy access to the company's website and the 23-page PDF manual. Well-written and laid out with plenty of annotated diagrams and pictures, the manual is a real treat. Every part of the plug-in is explained in depth, and there are plenty of helpful hints and suggestions. If only more manuals could be like this! Underneath the top bar you'll find all of the GAC-1's components and, pleasingly, every one has its own bypass switch. The main box can be thought of as the unit's command centre. Here, you can choose from ten different routings (the order in which the effects are chained) and this is where the GAC-1 can really help to speed up your workflow. If you're wondering how it will sound to re-order the effects, one click in the main box is often all you need. The preformatted chains - from simple serial connections through to side-band filtering and signal splitting - cover a broad range of possibilities, and the 40 bundled presets show off the GAC-1's sound-sculpting potential. The four-band parametric EQs have five filter types: low cut, low shelving, peaking or bell, high cut and high shelving. The compressors feature modes that can be used for warmth or smoothness, transparency or character-changing, and include a handy algorithm to decrease pumping and increase loudness. But why two compressors and EQs? Well, doubling up means you could, for example, tweak the bottom end of a bassline with the first EQ, run it through compressor 1, and then squash the results again with different settings on the second EQ and compressor. The plug-in comes in three forms (stereo, stereo with sidechain, and mono with sidechain) and functions with 64-bit floating point internal processing. It's also worth noting that it puts only a tiny load on your system. There's no Mac version of the GAC-1 yet, but PC users should download the demo right away.